Strength and muscle mass increases naturally during adolescence and early adulthood. However, around the age of 30, strength begins to decline. This decline is slow and for all practical purposes undetectable over the first couple of decades. However, by 50 years of age strength starts to decline at an accelerated rate resulting in a 15 to 20% decrease over the next 20 years. At approximately 70 years of age, the rate of decline accelerates once again to about a 25-30% loss per decade. This decline in strength parallels a loss in muscle mass caused by a reduction in both muscle fiber size and number (1-3). Although other factors for the decline in strength have also been implicated, such as a reduction in neuronal recruitment of muscle fibers, the major reason for the loss in strength appears to be due to a loss in muscle mass. The loss in strength with age is not benign. As most individuals realize, loss of strength is associated with frailty, weakness, reduced mobility, functional disabilities and increased injury due to falls. However, recent research suggests that declines in strength are also associated with an increased risk of cardiovascular disease, type 2 diabetes, some forms of cancer, other metabolic disorders and all-cause mortality (4-6). Therefore, it is important to understand the reasons for muscle loss with age, and develop appropriate strategies to combat this loss. Muscle mass is controlled by the rate of protein synthesis and protein breakdown. For muscle to grow, the rate of protein synthesis must exceed the rate of protein breakdown, and for muscle atrophy or muscle loss to occur, the rate of protein breakdown must exceed the rate of protein synthesis. Therefore, once middle age is reached the rate of muscle protein breakdown starts exceeding the rate of protein synthesis. It is generally believed that the rates of protein synthesis and breakdown are normal in the elderly under basal conditions. That is when at rest and removed from food consumption for several hours. However, activation of muscle protein synthesis appears to be significantly impaired following exercise or nutrient intake, and it is the inability to sufficiently activate muscle protein synthesis that results in age-related muscle atrophy (7). Dietary protein is a strong activator of muscle protein synthesis. Research indicates that it is the essential amino acids found in dietary protein that is responsible for activation of protein synthesis. Ingesting 7 grams of a mixture of essential amino acids will significantly increase muscle protein synthesis in young adults, but it has little effect on muscle protein synthesis in older adults (8, 9). However, by increasing the amino acid dosage, muscle protein synthesis rates comparable to those found in young adults can be achieved in older adults [10, 11]. These findings suggest that older individuals need more dietary protein on a daily basis to maintain a physiological relevant muscle protein synthesis. The recommended daily allowance or RDA for protein is 0.36 g per lb. of body weight, and represents the quantity of protein that should be consumed daily to meet population needs and to prevent deficiency. However, factors including physical activity pattern, body type and age can have a significant influence on protein need. Research now suggests that as individuals approach 45 to 50 years of age there is an increased requirement for dietary protein. In fact, once one reaches middle age, the requirement for dietary protein increases to between 0.55 to 0.68 g of protein per lb. of body weight (12). For someone weighing 150 lb. this would mean that daily protein consumption should be 85 to 100 grams of protein. 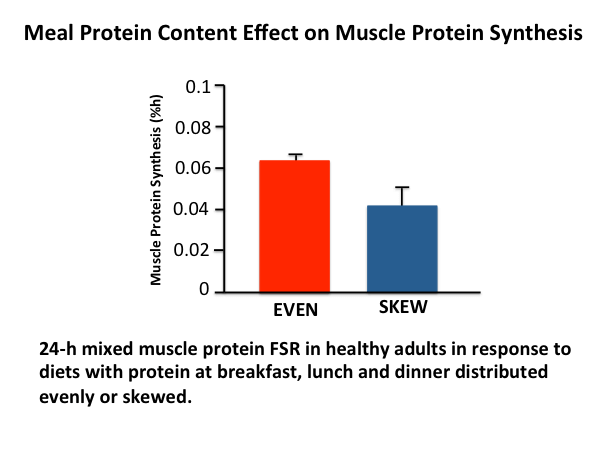 of protein at each meal, muscle protein synthesis can be activated for several hours after each meal (Figure 2 (15). This will positively influences 24-h muscle protein synthesis and result in an increase in whole-body lean tissue mass in healthy middle age and older adults (16, 17). Late night protein snack. Consuming a protein snack such as Greek yogurt, turkey breast, low fat chocolate milk or a protein supplement before bedtime can also be beneficial. During sleep there is generally a loss of muscle protein as muscle is broken down and the amino acids released are converted by the liver to glucose in order to prevent blood glucose from falling (18). Recent research indicates that consuming a protein supplement before bedtime will promote muscle protein synthesis while sleeping, and increase whole body protein balance in the elderly (19). Moreover, participants in a 12-week resistance exercise training program who received a pre-bedtime protein supplement were found to had significantly greater increases in muscle mass and 20% greater increases in total body strength than participants that received a non-caloric placebo (20). The decline in muscle mass and strength with age is pre-programed into our DNA. However, the rate of decline is heavily influenced by dietary considerations. 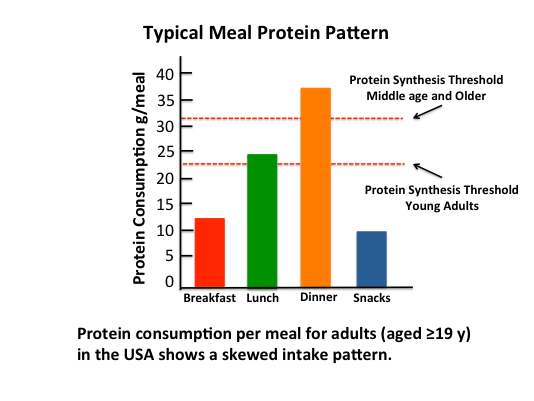 With age the ability of dietary protein to activate muscle protein synthesis is significantly reduced, thereby requiring an increase in daily protein consumption to maintain a physiologically relevant protein synthesis. The most effective means of increasing daily protein consumption is to increase protein intake across each meal of the day. It is also important to consume an amount of protein that is sufficient to activate muscle protein synthesis following each meal. Middle age and older adults should consider consuming about 30 to 35 grams of protein at each meal. Finally, consuming a small protein snack about 30 minutes before bedtime can stimulate muscle protein synthesis while sleeping as well as help improve whole body protein balance. Metter EJ et al. Age-associated loss of power and strength in the upper extremities in women and men. J Gerontol 52:B267-B276, 1997. Evans WJ & Lexell J. Human aging, muscle mass, and fiber type composition. J Gerontol A Biol Sci Med Sci 50(Special Issue):11-16, 1995. Frontera WR et al. A cross-sectional study of muscle strength and mass in 45-to 78-yr-old men and women. J Appl Physiol 71:644-650, 1991. Leong DP et al. Prognostic value of grip strength: findings from the Prospective Urban Rural Epidemiology (PURE) study. Lancet 386:266-273, 2015. Ruiz JR et al. Association between muscular strength and mortality in men: prospective cohort study. BMJ 337:a439 doi:10.1136/bmj.a439, 2008. Gale CR et al. Grip strength, body composition, and mortality. Intern J Epidemiol 36:228-235, 2007. Wolfe RR et al. The role of dietary protein in optimizing muscle mass, function and health outcomes in older individuals. Bri J Nutr 108 Suppl 2:S88-93. doi: 10.1017/S0007114512002590, 2012. Katsansos CS et al. A high proportion of leucine is required for optimal stimulation of the rate of muscle protein synthesis by essential amino acids in the elderly. Am J Physiol 291:E381-E387, 2006. Volpi E et al. The response of muscle protein anabolism to combined hyperaminoacidemia and glucose-induced hyperinsulinemia is impaired in the elderly. J Clin Endocrinol Metab 85:4481–4490, 2000. Moore DR et al. Protein ingestion to stimulate myofibrillar protein synthesis requires greater relative protein intakes in healthy older versus younger men. J Gerontol A Biol Sci Med Sci 70:57–62, 2015. Paddon-Jones D et al. Amino acid ingestion improves muscle protein synthesis in the young and elderly. Am J Physiol Endocrinol Metab 286:E321–E328, 2004. Wolfe RR et al. Optimal protein intake in the elderly. Clin Nutr 27:675-684, 2008. Boersheim E et al. Amino acid supplementation improves muscle mass, strength and physical function in elderly. Clin Nutr 27:189e95, 2008. Solerte SB, et al. Metabolic effects of orally administered amino acid mixture in elderly subjects with poorly controlled type II diabetes mellitus. Am J Cardiol 93:A23e9, 2004. Paddon-Jones D et al. Protein and healthy aging. Am J Clin Nutr 101(Suppl):1339S–45S, 2015. Mamerow MM et al. Dietary protein distribution positively influences 24-h muscle protein synthesis in healthy adults. J Nutr 29:doi: 10.3945/jn.113.185280, 2014. Norton C et al. Protein supplementation at breakfast and lunch for 24 weeks beyond habitual intakes increases whole-body lean tissue mass in healthy older adults. J Nutr 146:65-69 doi: 10.3945/jn.115.219022, 2016. Groen BBL et al. Intrgastric protein administration stimulates overnight muscle protein synthesis in elderly men. Am J Physiol Endocrinol Metab 302:E52-E60, 2012. Res PT et al. Protein ingestion before sleep improves postexercise overnight recovery. Med Sci Sports Exerc 44:1560-1569, 2012. Snijders T et al. Protein ingestion before sleep increases muscle mass and strength gains during prolonged resistance-type exercise training in healthy young men. J Nutr 145:1178-84, 2015. With a PhD in Exercise Physiology, Dr. John Ivy is our President of HumanN’s Science Advisory Board. He has authored over 180 scientific papers and several books, including the well-known and highly respected Nutrient Timing: The Future of Sports Nutrition. Working with notable sports greats, and Olympians in preparation for the 2008 and 2012 Summer Games, his contributions to sports nutrition and science are unparalleled. In addition to receiving a Citation Award from the American College of Sports Medicine and being named a Fellow in the American College of Sports Medicine, he is also one of the newest members of the University of Texas Department of Kinesiology and Health Education Hall of Honor. Dr. Ivy’s research has pioneered our understanding of muscle metabolism and the role that properly formulated nutritional supplementation can play in improving exercise performance, recovery and training adaptation. His current research is centered around understanding the interactions of exogenous dietary nitrite/nitrate (NOx) on the endogenous NO/cGMP pathway and how dysfunctions in each system can affect cardiovascular health. Dr. Ivy received his Ph.D. in Exercise Physiology from the University of Maryland, and trained in physiology and metabolism at Washington University School of Medicine as an NIH Post-Doctoral Fellow. He has served on the faculty at the University of Texas for over 30 years and as Chair of the Department of Kinesiology and Health Education for about half that time. Dr. Ivy is currently the Teresa Lozano Long Endowed Chair Emeritus at the University of Texas at Austin.